through participation in Civil War re-enactments, encampments, living histories, demonstrations, parades, memorial services, and other civic functions. Membership is open to any individual, aged 18 or older, possessing an earnest interest in the American Civil War and a willingness to attain the objectives of the organization. Individuals under age 18 require express written consent and participation of a parent or guardian to be deemed eligible for membership. All minors must be accompanied by a parent or legal guardian at all events. Re-enacting is a hobby that is not for everyone. We seek to portray, as authentically as possible, Virginia soldiers and civilians from Fairfax County in the period 1861–1865. Though fees are nominal, there are minimum uniform and equipment requirements to provide authenticity, which can be expensive. Below is an estimate of costs and what you need to get started. Annual company dues are $28 for individuals or $38 for a family membership. From this fee, the company pays your regimental and brigade dues, which provides supplemental accident and liability insurance. This insurance is active during participation in sanctioned events and is secondary to your primary insurance policy, if you have one. Sanctioned events are any re-enactments, living histories, ceremonies, parades, lectures, etc. which are on our schedule and provided to the regiment at the beginning of each re-enacting season. During the season, if events are added to our schedule, an updated list is sent to the regiment as additional sanctioned events. After a probationary period, members become established with full voting rights in company business. The larger events, at which battles are re-enacted, normally all charge registration fees (yes, we pay to be the entertainment!). The fees range from $2 - $25 per event and are used to provide re-enactors with water, straw, firewood, and the all-important port-a-pottys. On occasion, some events provide a Saturday evening meal, as well. Many events charge on a sliding scale, with lower fees for early pre-registration and higher fees for "walk on" participants. 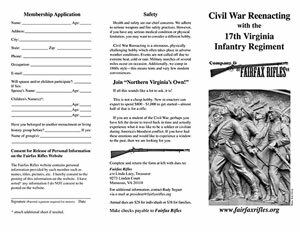 As a company, the Fairfax Rifles try to get everyone pre-registered early to take advantage of the lowest fees, so the average is usually five or ten dollars each. Fortunately, most living history events, parades and ceremonies in which we participate are free! At larger events or two-day living histories, when a large part of our group participates, the company cooks provide meals. Members can participate in these meals for a small fee, usually $5 per day. In most cases, $10 will cover meals from Saturday breakfast through Sunday lunch. Participation in most company meals is voluntary, however, there is a small meal cost added to the event registration fee at maximum effort events. The company does not provide beverages, due to the expense of having a sufficient variety on hand. Normally, actual charges for meals will be known before your arrival at an event. In order to facilitate budgeting for items a cost range has been added. † Six-winged or "hot" caps are for in-line black powder weapons and can cause serious injury if used on our rifles. Civilian clothing does not have the same kind of mandatory equipment as the military. Of course, there is a minimum amount of clothing required in order for civilian re-enactors to pass as 19th Century citizens. All outer garments, shoes and eyewear should be as close as possible to the 1860s period. There is a little flexibility in the area of children's shoes (they are outgrown so fast! ), but they should be made of leather, not sneakers. Your best bet is to talk to one of our civilian members before purchasing a lot of civilian gear. Also, there are resources on our Links page to other web sites which deal with civilian re-enacting. Yes, as you can see, re-enacting is not a cheap hobby. New military re-enactors can expect to spend $800 - $1,000 to get started—almost half of that is for a rifle. We do not expect everyone to have the resources to invest in everything they need right away. It is best to meet and talk to us before making any major purchases. We can offer suggestions which may steer you away from unnecessary or shoddy items and save you money. Also, not every unit has the same uniform or standards. Until you have made a commitment to a unit, you don't want to invest heavily in a specific uniform or equipment. Meeting us allows you to see if you like re-enacting, the 17th Virginia Infantry and our group. You can then make more informed decisions. Health and safety are our chief concerns and we adhere to serious weapons and fire safety practices. However, if you have any serious medical condition or physical limitations, you may want to consider a different hobby. Civil War re-enacting can be a strenuous, physically challenging hobby which often takes place in adverse weather conditions. Events are not called off due to extreme heat, cold or rain. Military marches of some distances occur on occasion. Additionally, we camp in 1860s style—this means tents and very few modern conveniences. If all this sounds like a lot to ask, it is! But, if you have the desire to travel back in time and experience what it might have been like as a soldier or civilian during America's bloodiest conflict, we are looking for you. 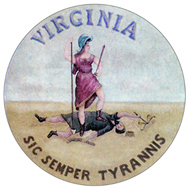 We are the only unit to portray the men and women of the 1860s from historic Fairfax Court House, Virginia. Our goal is to honor those men and women, many of whom gave the ultimate sacrifice, "…their last full measure." The ultimate history experience awaits you as a re-enactor in the Fairfax Rifles—part of Northern Virginia's Own! Site Design by Stephen Wolfsberger Last Updated September 11, 2013.